There was a time when Sears was considered America’s greatest retailer. Sadly, that time has long since passed and today the company is in state of serious distress and, short of a complete overhaul, inevitable collapse. As I wrote about Radio Shack’s failing back in December, it would be easy to point blame on the changing retail landscape but there are just too many retailers doing well (in the same conditions) to justify that case. From my standpoint, and countless thousands of disgruntled past customers, the problem is painfully clear; Sears has long lost its customer focus and anything resembling a customer service culture. 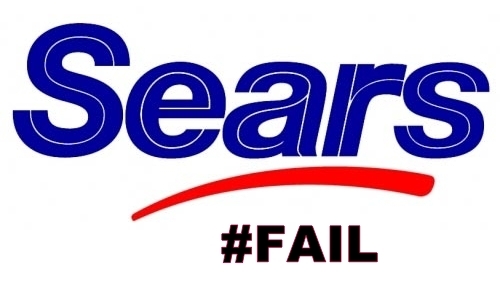 According to Consumer Affairs, an astonishing 86 percent of customers are unsatisfied with Sears’ customer service. That puts them at the bottom of the rankings under their primary competitors Macy’s, JCPenny, and Kohl’s. On a recent business trip to Indiana, I ripped the seam on my garment bag while attempting to unzip it in my hotel room. Although the timing was terrible for this wardrobe holder malfunction, that bag serviced me well over several years and many thousands of miles of travel. Normally, I would have just ordered a new one on Amazon.com and waited the 2 days for my trusty Prime membership delivery. But, being on the road, and faced with a bag that would no longer close properly, I decided to stop in the Sears in Terra Haute the night before my departure to secure a new one. The first thing I noticed was how empty the place was. Only a handful of cars out front and only a few people noticeable on my walk through the store to the small luggage section. As I perused the bags for the 8 minutes or so, not one employee was seen but I could hear what sounded like two girls laughing not too far away. The only customers I could see were in the mattress section directly next to mine, a middle age woman pushing an elderly woman in a wheelchair. About 2 minutes after I arrived, the woman asked me “Do you work here?” When I advised I was “just a shopper” she apologized and said “I can’t find any employees”. A few minutes later I heard her call out to a quickly passing by employee, “Excuse me.. do you work here?” The employee, who looked like he was being verbally assaulted, replied “Yes, but I’m leaving now..” “We’ve already been here 15 minutes”, the woman interjected”. “I’ll call someone to help you” he replied barely breaking stride as he rushed away (I assume for his vehicle). Several more minutes passed and, when nothing materialized, the woman sat on one of the mattresses holding the arm of the wheelchair.. “this is crazy Ma.. nobody will help us.. GUESS THEY DON’T WANT OUR BUSINESS” she just about shouted in a very frustrated tone as she wheeled out of sight. Another one bites the dust. When I located a suitable garment bag, I made my way towards the laughing sounds just around the bend not 15 feet away from where I and the mattress shoppers were. There I found 2 twenty-something female employees behind a cash register, one standing the other sitting, both on their dumb-phones enjoying something far more interesting (to them) then their job. It was painfully evident that they could care less about any shoppers experience as the one standing appeared visibly annoyed with the recess interruption as I approached to help fund their paychecks. As a customer service/customer experience consultant, I am always on the look-out for how businesses and their employees perform in these areas. This is especially important when it comes to managing problems because, as I wrote about here, the true test of a business’s customer service fitness is not when things are going right – but rather what is done when things go wrong. I’m writing to let you know about the terrible experience and utter disappointment we have had with the Kenmore dishwasher we purchased at Sears nearly 2 years ago. The dishwasher never performed as advertised when brand new and internal (plastic) parts broke within months of ownership. I tried to comment on my disappointment back then but my review was considered “too negative” and was never posted. The situation only worsened afterwards..
We have had a professional appliance repairman in twice to replace broken parts and the top rack still hangs down to the point of hitting stacked plates on the bottom preventing proper washing. Even after pre-rinsing only 50% of the dishes are ever clean and we’re constantly re-washing everything. Despite using several recommended products, the washing liquid never dispenses properly and the entire inside door is a constant mess of soap gunk. I’m happy to send pics of the inside of the unit along with our should be clean dishes. In a nutshell, this is not only the worse dishwasher we’ve ever had but the worst appliance of any kind. As we’ve given up investing anymore money into this machine and must replace, I’m wondering how Sears will respond to this situation and, at this time, a Very Unhappy Customer? Thank you for contacting Sears. I am sorry to hear that your Dishwasher is not cleaning the dishes completely. After reviewing your account I have scheduled a service for your Dishwasher on 08/14/15 between 1 PM to 5 PM. The technician will call prior to his arrival. We value your relationship with Sears. Please feel free to contact us back, If you have any further questions through email or calling the below provided number. Realizing the dishwasher was now out of warranty, I must admit at this point I was surprised and impressed that not only did Oggy express proper empathy but he also took action and, on behalf of Sears, scheduled a service technician to come out and ‘take care’ of the customer (me). Appreciate the scheduling of a technician to assess/service dishwasher but today is not ideal… can we move to Monday afternoon? Nothing. No reply. Oggy over and out evidently. At approximately 3PM, I received a call from the Sears tech who told me he was a half hour away. Apparently unaware of my earlier request to reschedule, I let him know I would be there to meet him. When the tech arrived, he dug right in to the machine.. taking the top rack out.. pulling the bottom drain thingy out.. spinning the lower spray arm. It looked like progress! Then he commented on how the plastic pieces that hold the top rack up were broken and needed to be replaced. Being well aware of this I inquired, “what exactly did Sears tell you?” “What do you mean” he responded with a bewildered expression on his face. I let him know that I didn’t request service and that his visit was something Sears scheduled, not me, and that I assumed this was a courtesy call. The tech was quick to tell me that he wasn’t aware of any of that, I would “have to pay for it”, and that even if I didn’t want the machine fixed there would still be a $75 fee for the visit. So I grabbed my iPad and pulled up the email I originally sent to Sears and reviewed with him. I pointed out the “I’m done investing into this machine” part and asked him what he thought. He admitted to being perplexed as to why he was sent but that, as far as he was concerned, this was just another service call. It really wasn’t the serviceman’s fault so I called Sears Customer Service and attempted to get Oggy on the line. No can do said the representative, but she could help me. I explained the situation and let her know that I was now standing next to the technician who expects to be paid for a service call I did not ask for or, at this point, want. She let me know that they don’t schedule courtesy service calls and I would indeed need to pay for the visit. I asked if she had access to my original email and she replied they do not have access to email (evidently still telegraphing in her department). I politely asked to speak with her manager. She let me know that she had “manager responsibilities'” and there was no one else there that could help me. I asked for her name. Maria said she could not provide her full name, instead offering me a 7 digit ID number. I asked if the call was being recorded and, if so, how I could obtain a copy. Maria at first denied then admitted the call may be recorded but there was “no way” I could receive. Ultimately, Sears turned my request for feedback into a sales call and stuck me with the bill. Adding insult to injury, their customer service representative, in a manner befitting a bill collector, made me feel like I had stolen something from them. There have been some real doozies in the past but this was the worst service recovery I’ve ever personally experienced. Sears has clearly lost its way and sight of its 2 most important assets: it’s employees and customers. Suffering from a poor corporate culture and no signs of an effective customer service training in place, Sears is left with disengaged employees alienating existing and would-be customers on a daily basis. Tragically, at this rate of rapid decline, it likely will not be long before Sears joins the list of once-great failed retailers. Monday Motivation: Push Yourself & Hustle! WOW! Your ordeal with SEARS was terrible. Too bad. Looks like SEARS just lost another customer. A Lesson Learned folks….. Take care of our customers by listening carefully and meeting their needs. It’s not as if everyone at Sears is a bad person that relishes terrible customer service. As usual, the problem starts at the top. 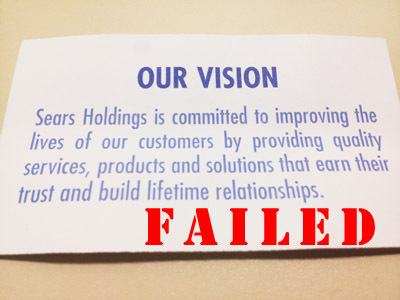 Until Sears corporate commits to creating and sustaining a customer service culture, they will continue their downward spiral to ultimate collapse.